Students participating in a project at Lake Erie Ink. Early childhood educator Vivian Gussin Paley wrote that “we learn to know what we are thinking about by the ways in which we play.” Dramatic play and storytelling are important to children as they learn to make sense of the world and work with one another. Lake Erie Ink, a nonprofit organization based at the Coventry P.E.A.C.E. Campus, states the belief that creative writing is not only for kids and teens who already love writing, but also for those who have something to say, and feel that no one is listening. Part of Lake Erie Ink's mission is to provide opportunities for children to tell stories. 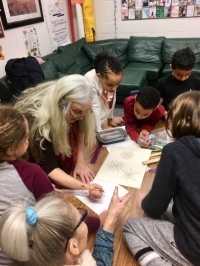 While students were on break from school over the winter holidays, Lake Erie Ink was buzzing with creativity during its Hot/Cold Creative Play Days. Afternoons of outdoor play, creative writing and art fired up the kids’ love of learning. Skits were written and performed, snowmen and penguins were created, and many new friendships were formed. At Lake Erie Ink, the learning continues even when school is out. Lake Erie Ink will provide additional opportunities for creative learning during the summer, and summer camp registration opens on Feb. 2. Visit www.lakeerieink.org for more information. Sarah Kloos recently graduated from Hobart and William Smith Colleges with a bachelor's degree in English. She currently lives and works in Cleveland Heights.